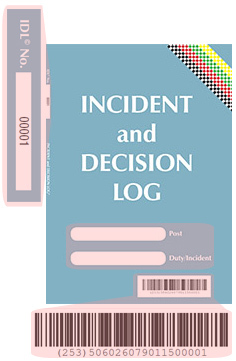 The Incident and Decision Log© (also known as the IDL©) fills the need for a definitive record for all staff involved in emergency duties who need to make decisions. Designed for post holders, or an ad-hoc group, it allows a legal record to be created for future reference. This enables an organisation to fulfil its obligation to have a record of information received and decisions made for a complex emergency incident, information for which may be contained within a number of books. 43 sequentially numbered decision pages. Soft cover. Combining the Emergency Incident Record Book (EIRB©) and Decision Log Book (DLB©), the Incident and Decision Log© (IDL©) fills the need for a definitive record for decision-making staff involved in emergency incidents and duties in a convenient, single book. As either an alternative or supplement to the EIRB© and DLB©, the book is organised to provide a complete and legally verifiable audit of incidents together with any decisions made. Each book has a unique number and GS1 barcode. Both uniquely identify the book across international and organisational boundaries and over time. The front cover provides areas to fill the post holder (staff member responsible for the book) and the duty/incident to which the book pertains. The first section of the book concerns incident logging, 98 pages in total. 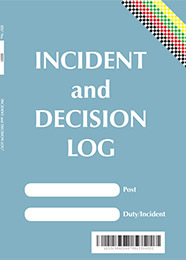 The start of the incident log contains a section for describing the incident or duty. In addition to areas for describing the post and organisation name, this section contains: the name the incident is to be referred to as, when it started (24 hour clock), its location, the time it was finished and finally, when known, the total number of record books associated with a specific incident. On the page opposite, individual record keepers for the duration of the incident are also recorded withsignature, organisation and initial. The remaining 98 pages of the incident section contain the incident log itself, shown in table across two visible pages of the open book. Each table has room for 32 log entries, allowing for over 1500 incident log entries in the book. The incident log entry is shown The entries are shown above. The entry number (sequentially from 1 - n) can be used to mark any other document which relates to that entry, for example emails, phone messages or other documents. This facilitates subsequent analysis. When a book is filled, books used in continuation should start with the number n+1. Entries should be initialled to ensure an accurate and complete record. Entries can be made by a "loggist" or assistant(s), but the post holder or incident manager must initial each entry to signify that it accurately reflects the information received and action taken. If it is a duty book, the individual would obviously make and initial their entries. The IDL© provides areas which must be completed to record details of all contact and message details in addition to actions required. All entries must be initialled. In addition to areas for describing the decision making group/individual andChairperson of the group, this section contains: the name the incident is to be referred to as, when it started (24 hour clock), its location, the time it was finished and finally, when known, thetotal number of record booksassociated with a specific incident. The remaining pages provide detailed recording for up to 10 decisions. The first page concerns logging date and time details, the nature of the issue requiring a decision and brief supporting facts and information. The date and time of the start, decision reached, decision logged anddecision implemented are recorded in the appropriate placeholders. 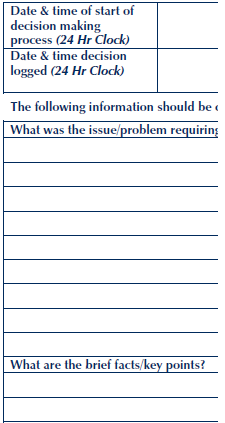 Over a quarter of the page is devoted both to the issue/problem overview(that should indicate why a decision is needed) and a brief supporting facts / key points section. At the bottom of the page there is an entry for linking to supporting logbooks that document information relating to this decision. If possible the above information should be recorded where appropriate in advance of any decision-making meeting that may take place. The second page of an individual decision in the IDL concerns documenting options considered as part of the decision making process, together with reasons for choosing and/or not choosing them. This section presents a table in landscape format that fills the page, providing space to document up to five options and the reasons for either choosing or not choosing them. The first column in the table presents space to record the five options, the first being by default 'Do Nothing'. The remaining up-to-four choices should be briefly described here and, if known, 'yes/no' should be struck through to indicate that this choice has been accepted or ruled out. The second column provides space to document reasons for choosing each option, while the third provides space to document reasons for not choosing each option. This page of an individual decision in the IDL concerns actions to be taken, by whom, and when. Up to ten actions can be recorded on this page. This section presents a table in portrait format, which provides space to document each action. The first column in the table records a brief description of the action itself, while the second provides space to record who carried out the action. The third column records the date and time of the action, the fourth signs off the completion of the action and the fifth any additional comments. The last page of an individual decision in the IDL concerns recording additional documentary evidence and signing off/initialling by all staff involved in the decision. The first section occupies two thirds of the page and allows ample room for recording all additional supporting documents relevant to this decision. Additional space is provided for recording the organisation and post holder that is the custodian for these documents. The section ends by recording whether the decision should be reviewed at a later date. The final section provides room for all staff members involved to initial (sign off) the decision, together with the date/time that this occurred.